On a previous post I described a simple example, of how-to cross compile an Windows application in a Linux environment. Although this worked fine and raised my motivation, it is not a very useful example since the real world is much more complex. One of the complexities that I want to introduce is the use of Qt libraries, that are used thoroughly in my projects. I will now go in detail, through a slightly more complicated “Hello World”, where I make use of these libraries. 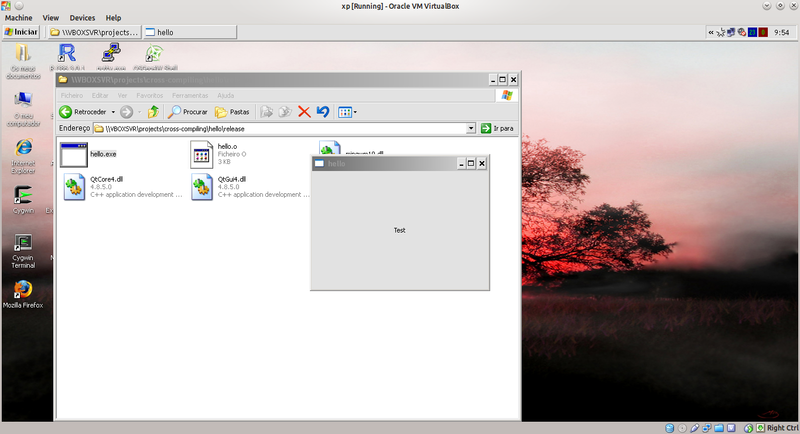 A key thing to understand, when cross compiling with Qt, is that you need to setup the development environment, both in the host and in the target OS (those are in this case: Ubuntu and Windows). As I mentioned before, you also need a working Qt environment for Linux. I had Qt 4.8.7 installed in my machine, and I stupidly thought I could use that; it turns out I can not. The Qt versions in Windows and Linux need to match! Since MinGW did not released a 4.8.7 version yet, I decided to download the Linux version of Qt 4.8.5, and installed it along with my current version (let us see what problems this may bring me in the future, if I keep developing in 4.8.7!). The next step is to configure the mkspecs for cross-compiling; for that you need to navigate to /usr/local/Trolltech/Qt-4.8.5/mkspecs and create a new directory there. I called it “win32-x-g++”. Inside this directory, you need to place a version of qmake.conf, with all the necessary information for cross compiling; mainly you need to pay attention to the paths of the Qt installed in Wine, and the minGW paths in Linux. Here is a working version for me; please amend it to reflect your paths. This is just a Window with “Hello World” written, but it is calling the Qt Libraries. If this points to /usr/local/Trolltech/Qt-4.8.5, then everything is ok; otherwise, please take a moment to export your $QTDIR. Then you can compile the application, using make. If the compilation was successful, you should be able to run the executable “hello.exe”, using wine. When I attempted to do this, I had some errors that related to not finding some libraries. As in my previous example, I copied “mingwm10.dll” to the current directory, but I still had errors related to Wine not finding the Qt libraries. 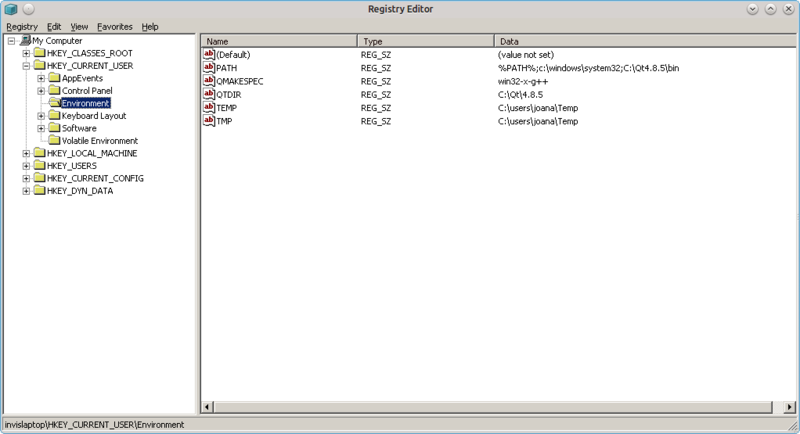 I edited the QTDIR and PATH variables on Wine(Windows), by calling regedit. This was a nice outcome, however it is still necessary to do this for the entire project, tracking all required Qt dll’s, Boost, and any other needed libraries. It would probably be a good idea to consider static linking, since I would not have to ship the DLL’s, and would also avoid digging into the problem of “why Wine is not finding the shared libraries”. However, from my experience, static linking of the Qt framework is quite an onerous task, and in this case I would have to do it twice (for Linux and for Windows).